There. I said it, and it feels good. Normally, I’m not quite so smug. Because normally, whatever it is that I’m being smug about has a way of coming back to bite me. And this may yet. But, for now you’ll all have to indulge my happy dance because, well, my child* ate lentils. 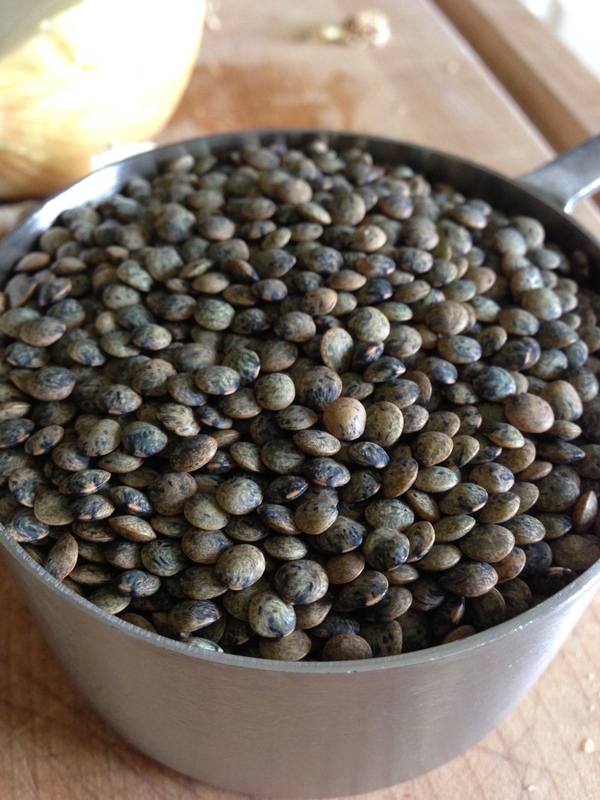 Lentils are not only one of the oldest food sources on the planet, but also one of the healthiest. They are protein-packed, iron-rich and have plenty of vitamin B1, folate, and fiber. And for those of you whose lentil knowledge begins and ends at the failed casseroles Neil cooked on the British sitcom The Young Ones (please tell me I’m not the only one who gets that 1980s reference), I’m here to change your mind…and hopefully your supper plans, too. Let’s leave The Young One’s dilapidated UK kitchen behind for a bit, and pop over the English Channel to France, where the lowly lentil would never be subjected to the tortures endured at Neil’s hands. In France, the lentil is venerated, not desecrated. And it is from the bistros and farm kitchens that this vegetarian recipe has been adapted. Several years ago I enjoyed a wonderful pan-roasted salmon on a bed of French lentils, and I started with memories of that meal in recreating this lentil dish. French lentils — specifically, Le Puy green lentils — are a delicious, small green variety of this legume that, in my opinion, balance the lentil’s sweet and earthy qualities beautifully. Like other lentils, they cook quickly and are relatively inexpensive, making them an attractive weeknight dinner option. I like to load this dish up with veggies that include onions, carrots and celery, and serve it topped with a poached egg (perfect your technique using this Food52 video on How to Poach an Egg, or pick up a new poached egg tip by reading Bon Appétit’s Trick to Making Perfect Poached Eggs). A bite of the lentils coated with some of the runny egg yolk is pure heaven — not to mention protein-dense and nutritionally-loaded. If you forgo the egg, this dish is not only vegetarian, but vegan too. Or, substitute some sautéed or roasted fish — like salmon — for the egg. Sublime. The real flavor trick in this dish is something I learned from an Ina Garten recipe for Warm French Lentils: when they are finished cooking, combine the lentils and sautéed veggies with a simple vinaigrette made from Dijon mustard and vinegar. Ina uses red wine vinegar in her vinaigrette, but we prefer the milder taste of a golden balsamic vinegar. Experiment a little to figure out what you like. If you — like I — like to get your kids into the kitchen to cook with you, there are plenty of steps in this recipe with which they can assist. Peeling carrots is a new favorite activity in our kitchen, just a bit safer than actually letting the kids chop veggies (although Daughter 1 is getting pretty good at that, too!). There is lots of measuring in this recipe, and the opportunity to mix the vinaigrette into the finished lentils is definitely kid-friendly. And whenever I need fresh herbs, like the thyme in this recipe, I send our Stout Sprouts out to what passes for an herb garden in our back yard — it’s been a busy summer, and I haven’t done nearly enough weeding! Most other gardens, yours included no doubt, would put mine to shame. So let the kids do a little thyme-harvesting while you’re working the stove top. This dish reheats extremely well too, which makes it a great cook-ahead meal. Make an extra big portion of the lentils one day and, after warming them in the microwave or stove top, poach a fresh batch of eggs when you’re ready to serve the leftovers. I’m loving that now that my job has me away from home more frequently…easy and fast weeknight meals make the evenings go much more smoothly. This is a dish that will leave you saying “incroyable” while your taste buds say “yum.” And your heart…well, it will thank you, too, for keeping it healthy and happy. 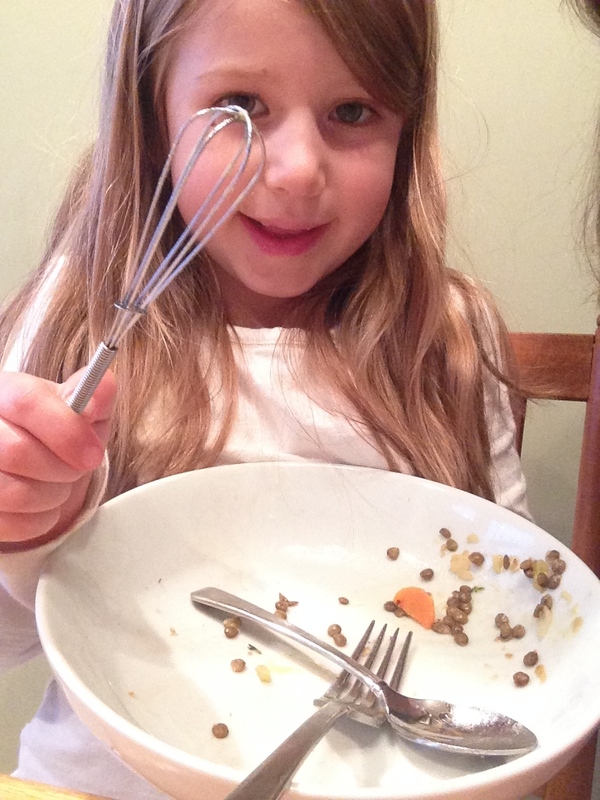 So…my child ate lentils. That, too, makes my heart happy. * Why the asterisk? Because my child ate lentils. Not my children. And I’m just as happy and proud, but looking forward to a day when both children embrace this dish. In the meantime, we’ll just keep trying with Daughter 2 because this dish is definitely a winner! Begin by cooking the lentils. In a large stock pot, combine the lentils, the onion half that has been left whole, bay leaves, baking soda, and water. Bring to a boil and simmer for 20 – 30 minutes, or until the lentils are just tender but not mushy (the baking soda helps keep the outer hull of the lentils slightly firm, while allowing the interior to cook to a tender consistency). As soon as the lentils are soft, drain them and discard the onion half and the bay leaves. Set the lentils aside. In a large sauté pan, heat 2 teaspoons olive oil over medium heat. 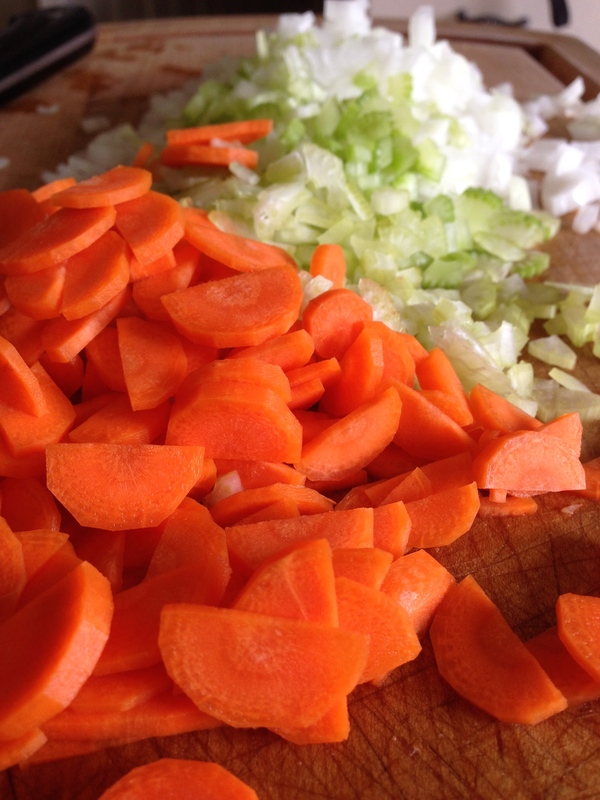 Add the diced onions, carrots, celery and salt and sauté until quite soft and tender — 15 to 20 minutes. Add the garlic and thyme leaves and continue to sauté for another 2 – 3 minutes. Add the reserved lentils and combine, allowing flavors to come together over the heat while you prepare the dressing. In a small, steep-sided bowl, whisk together the remaining 1/4 cup olive oil, the Dijon mustard, and the balsamic vinegar. Season with salt and pepper. 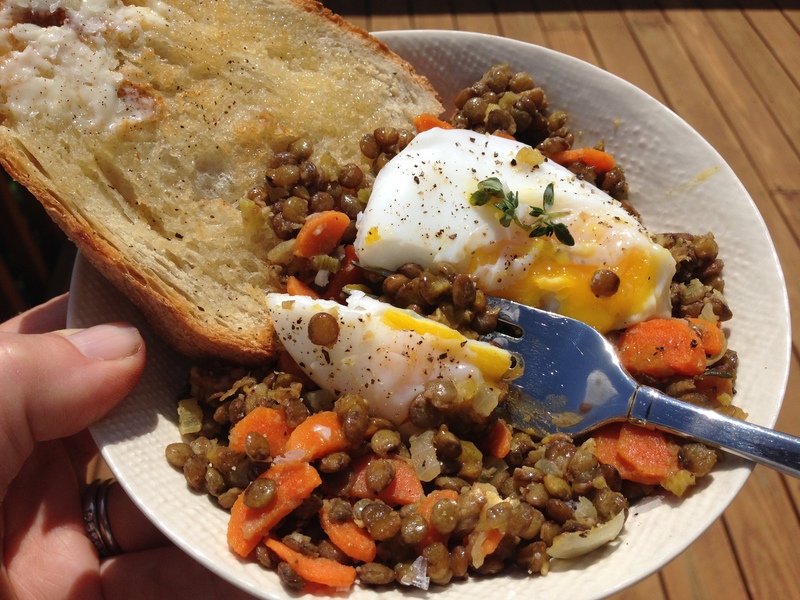 To serve, ladle some of the lentils onto a plate and top with one or two poached eggs. If you’d like, serve with slices of toasted, thick-cut artisanal bread, which are great for sopping up both the egg yolks and lentils. Kid rating: three stars. Daughter 1 cleaned her plate, declaring afterwards that she thought she “might actually like lentils,” as if this was a big revaluation. This was the win I was looking for, and I’m so proud of her for trying something that previously would have sent her into hiding. Daughter 2 tasted and liked the mustard dressing, but just couldn’t quite bring herself to eat the lentils even after we told her they were cousins of the beans she likes so much. Maybe next time! So…one for two. Not bad! Parent rating: five stars. Personally, I’d give this six or even seven, but my husband might have to talk me down a little on that. This has become my favorite summer go-to dish, with earthy, complex flavors and a finishing vinegar burst that I absolutely love. It is fantastic on its own, even better with toast and a poached egg, and pairs well with poached salmon if you’re going for a completely different flavor profile (in which case, serve it without the eggs). I really didn’t think the Stout Sprout family would take well to this dish — I offered apologies when I served it for dinner (proclaiming it a “mom dish”), until my husband told me the apologies were unnecessary…it was plenty tasty, and nobody was complaining! 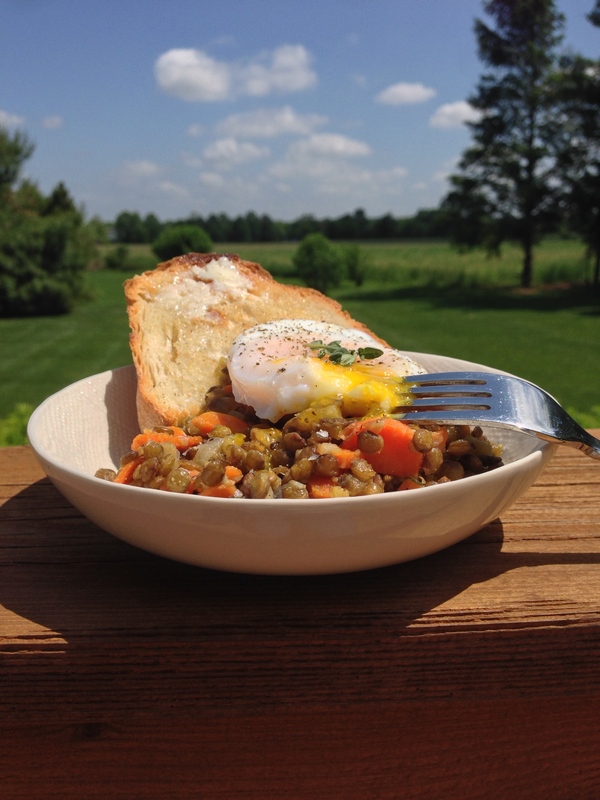 .the French Lentils w/Poached Eggs were scrumptious and I’m not a fan of mustard. This was a completely random find that I tried immediately. This will be one of my ” go to” recipes. I did overcook the lentils..looking forward to improving the technique on this. I’m so glad you enjoyed this recipe. Happy cooking, and thanks for letting me know!